Forget the cat in the hat because the man in the hat Paul Carrack made a triumphant return to the Symphony Hall stage tonight. Promoting his most recent album These Days this is the man who was inspired by a school careers teacher to pick up his guitar to learn some more chords, at the age of 15, after a trip down the local coal mine made his mind up that unlike many other Sheffield lads mining was not going to be his destiny. Still enjoying the path he chose to take he has now released an incredible 17 albums in his own name and the loyal fanbase present this evening devoured both the old and new from his vast catalogue. As is par for the course with Paul Carrack gigs the opening act was an inspirational choice to set the mood for the evening ahead. Singer and songwriter Lauren Ray took centre stage with just her keyboard and microphone to serenade the audience with her delicate take on piano led music which combines elements of country and pop. Numbers such as ‘Drive’ and ‘One Of The Lucky Ones’ were soulfully delivered with her sultry voice providing comparisons to Alison Krauss and Suzanne Vega. It is the lovely story telling in between songs which allows the listener to feel engaged with the lyrics. Ranging from ‘Dull Ache’ about how grief can leave you with that horrible feeling in the pit of your stomach to new number ‘Irreplaceable’ about relationships. Having already provided support to the likes of Anastacia, Lucy Spraggan and Rebecca Ferguson this current tour should do her the world of good prior to the release of her new album ‘Woman In The Arena’ which is released in May. Looking immediately at home in the auspicious and opulent surroundings of the Symphony Hall Paul Carrack and his band of brothers put their heart and soul into delivering just what everyone wanted from the off with ‘Late At Night’ and ‘Amazing’ opening proceedings. Don’t you just love those unplanned moments at gigs? Well tonight was no exception as Carrack made himself comfortable at the keyboards and was about to burst into ‘Satisfy My Soul’ when he realised he was sat at the wrong instrument. Quickly relocating to his Hammond organ he apologised to all for his ‘senior moment’. Maybe it was the lack of vision from his ever present sunglasses that allowed his navigation to go astray but whatever the reason it was another opportunity to show why he just comes across as a real humble guy to his fans. For many the ticket price would have been validated by the rendition of ‘Eyes Of Blue’ where every lyric was sung with emotion and meaning. There was a good smattering of tracks from the ‘These Days’ album including the title track, with its reggae style and ‘Life In A Bubble’ where Carrack showed that he can not only still write great soulful music but also deliver it on the stage. When is an intermission not a break? At a Paul Carrack gig it’s when a slimmed down trio including son Jack (drums) and Jeremy Meek (bass) form a troupe with him at stage front to take the mood down for a waltz through a selection of quieter numbers including ‘That’s All That Matters To Me’ and ‘Dig Deep’. Picture yourself watching a lounge act treating the music with the love and respect it deserves and you won’t be far from the image created. Surrounding himself with a formidable group of musicians Carrack doesn’t need any glue to bond them together. They are as tight as the proverbial with enthusiasm radiating from all parts of the stage. In the rock world you have your guitar gods and if such a euphemism could be used for the saxophone then Steve Beighton should be lauded as such. His playing tonight was exquisite particularly the solo on ‘Bet Your Life’ with a few of the faithful even getting out their air sax to accompany him. It was a nice touch to dedicate ‘Love Will Keep Us Alive’ to the sadly departed Glenn Frey whose band The Eagles included the Carrack penned track on their Hell Freezes Over album. Expectations were high as time drifted onwards and these were rewarded with ‘Living Years’ which was so good it could have made a few grown men and women weep tonight. Finally it was time to stretch the limbs and stand up to rejoice to the infectious melody of the 1974 Ace classic ‘How Long’. It was all wrapped up nicely with another Mike & The Mechanics number ‘Over My Shoulder’, ‘You Make Me Feel Good’ and a moving version of the Marvin Gaye classic ‘What’s Going On’. Everyone went home feeling they had witnessed a consummate performance from a true songwriting legend and his mates. 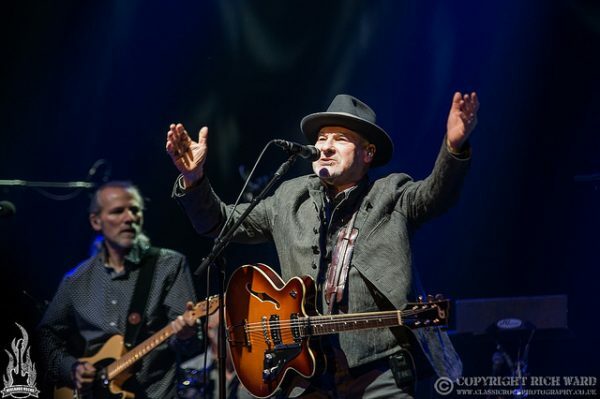 There is still time to catch up with Paul Carrack again at The Symphony Hall in Birmingham as the These Days tour returns to the same venue again on Sunday 3rd March 2019.